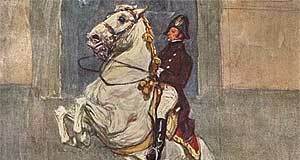 Alongside with Mozart, the Vienna′s Boys′ Choir and the Sacher Tart, the white horses of the Spanish Riding School are the primary icons of the country - all of them are excessively pimped by the tourism mafia and you might be shocked to learn that the vast majority of Austrians has never attended a performance by Riding School. It is very close to the heart of selling clichés and very far from the spirit in which I started to work on this website. The Spanish Riding School was started as something like a noble gimmick by Archduke Karl, the brother of the Emperor Maximilian II in the 1570ies. He founded the first studs in Lipica near Trieste (the former one is now Slovene, the latter one Italian). To get his horses the way he wanted them to be, Archduke Karl did something quite unusual for Habsburgs: cross-breeding. The "Lipizzaner" horses are a blend of Spanish, Arab and Berbian horses and served the Habsburgs for centuries in cavalry and show riding. However, the current courts of the Spanish Riding school gained their significant position through the influence of the horse fanatic Emperor Karl VI. When the empire collapsed in 1918, Lipica was suddenly not Austrian anymore. Only 1,000,000 Tourists per Horse! The horses were moved to the Styrian town of Piber, where they are still bred. There are studs in both places now, but only the one of Piber supplies the Spanish Riding School. A few years ago, Slovenia tried to get royalties from Austria for using the name "Lipizzaner" ("Lipicians"). Since this claim is rather ridiculous (think of the German Shepard, Irish Coffee or Krakow sausage), it didn′t lead to anything but added a new episode to post-imperial jealousy. The horse ballet itself is quite expensive and tickets are hard to get. Both shows and training sessions are booked out months in advance, so if you want to see the horses, you got to think ahead. Booking is possible through the Riding School′s website. Horse loving folks are usually deeply impressed by the performances, and some people come to Austria just for the sake of seeing one of the shows. They take place in the Winterreitschule ("Winter Riding School"), a Baroque hall built by Josef Emmanuel Fischer von Erlach in 1735. An alternative to see the horses for those who didn′t start to plan their trip a year in advance is to go to the "Lipizzaner Museum". Here you will learn more about the history of and cult around the white horses and you can see that they are actually born with a dark grey skin and lighten up as they grow. There are combined tickets available for the museum and a short training session that takes place in the Stallburg. By the way, something the official face of Austria does not tell the tourists is that only gay horses are chosen for the performances.